Mind mapping is a creative exercise that begins when you write down a central idea or theme, then draw lines that branch out into new "nodes," each with a new word or idea that's related to the first. Simple enough. And you can certainly mind map on a blank piece of paper, but digitalizing the process lends convenience and flexibility to the process. With a digital mind map, you're not confined to the size of your paper and can easily move ideas around with little effort. We tested dozens of mind mapping tools, and here we'll present the 11 best to help you decide which is right for mapping that mind of yours. What Makes for Great Mind Mapping Software? Unlimited canvas. If your mind mapping canvas has size limitations, it can cut your creativity short just because you run out of room. Even if you can't see your entire mind map at once, an unlimited canvas allows you to brainstorm until you're done. Ability to attach files. Sometimes text isn't enough to convey your ideas, or you want to include an external file as part of your brainstorming. In all of the best mind mapping apps, you can attach links, images, and other files to your mind map. Collaboration features. Any mind map apps that are built on the cloud should make it easy for multiple users to collaborate and comment on the canvas. All of the best desktop apps allow adequate cloud file sharing/syncing across devices so that multiple users can access and revise the mind map. Ability to save and export. These apps all allow you to save your map and re-edit it at a future date, and they all offer the ability to either share maps online or export them. The moment you log in to Coggle, you'll see the central node of a new mind map, along with an enticing plus sign to get started adding new nodes and ideas. Each time you click on the plus sign to create a new child node, Coggle will automatically choose the direction and placement of the new node. But you can always drag the nodes around to rearrange into a format that fits your layout a little better. If you prefer to use keyboard shortcuts during your mind mapping process, there's a cheat sheet of keyboard shortcuts that you can access by clicking on the green question mark icon in the bottom right corner of your canvas. One of our favorite features is that Coggle lets you format your mind map items and messages with Markdown, so you can get as fancy as you need to while adding your text, images, and links to the canvas. If you want to bounce some ideas off a friend, you can go ahead and add them to your mind map, carry on a conversation in the messages sidebar, or go into full-screen presentation mode to take a step back and do more high-level ideation. Coggle Pricing: Free for up to three private diagrams; $5/month for unlimited private diagrams and extra mind mapping tools (like additional shapes and color control). Mind mapping on a mobile device comes with a full suite of challenges, thanks to small screen sizes, the inconvenience of scrolling and zooming, and the readability issues that accompany all that. 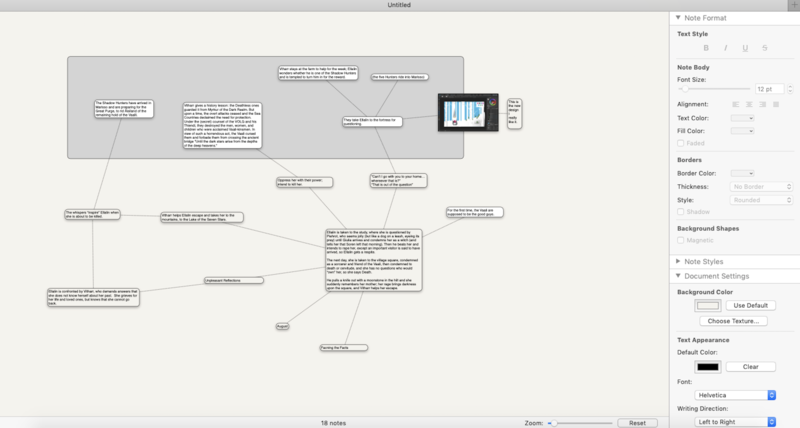 But Mindly's outside-the-box thinking makes mind mapping on a phone possible—and, honestly, pretty fun. Like most mind maps, you'll start with your central node, add text and icons, and change the color if you want. Then, it's time to start adding any associative ideas in the next outer layer. To do this, tap on any circle that you want to start adding your ideas to: Mindly will automatically open a new layer and zoom in to let you focus on the matter at hand. As you go deeper into sub-ideas (and sub-sub-ideas! ), you'll always be able to find your way back to the original center node by tapping on the circle in the top-left corner of the screen. Of course, you can sync your mobile mind maps with the desktop version of Mindly, so you can switch from on-the-go ideation to formal mind mapping sessions at your desk. Mindly Pricing: Free mobile version includes up to 200 elements per mind map; $6.99 on iOS for additional features including unlimited elements, passcode, and search; $29.99 on macOS. Draw.io lets you draw and create almost anything you want—including mind maps. Its drag-and-drop canvas allows you to add shapes, links, text, and images, as well as change colors, connect your ideas with lines, and so on. Because it's not strictly a mind mapping tool, you'll have to work a bit harder to manually add connecting lines between ideas and rearrange them so that everything fits nicely on the canvas. But some people will prefer the lack of templates because it gives you a little more freedom to find new, unexpected correlations between ideas. As a web-based app, you can access it directly from your browser, without even having to log in to an account. Or, go ahead and download the desktop version if you prefer to work outside of the browser. When using Draw.io, you'll notice that they advertise an integration with Samepage, an app that gives you access to additional features like real-time collaboration and comments from team members. We suggest the add-on if you enjoy the freeform mind map style of Draw.io but need to collaborate with other teammates on the mind map itself. iMindMap app was created in conjunction with Tony Buzan, the man who first developed the formal practice of mind mapping back in the 1960s. iMindMap gives you all the basics you need to create quick, meaningful mind maps. With over two dozen options (including text styles, node styles, and more), the toolbar can be a little overwhelming when you first get started, but it's nice to have all the node creation features available with a quick click. Once your basic mind map is on the canvas, iMindMap allows you to switch the visual layout. For example, you can select the time map view to give it a more linear format that illustrates timelines and task lists. 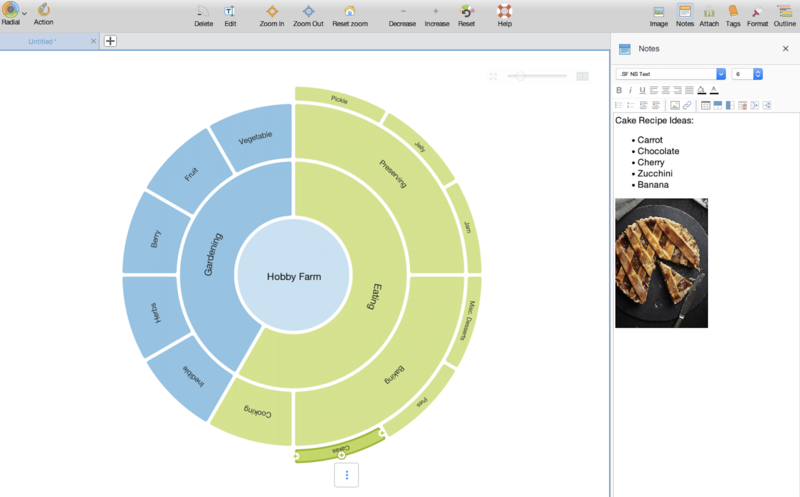 Or you can use the radial map view to break each idea down naturally into a series of circular rings and nodes, so you can more easily identify correlations between individual ideas. 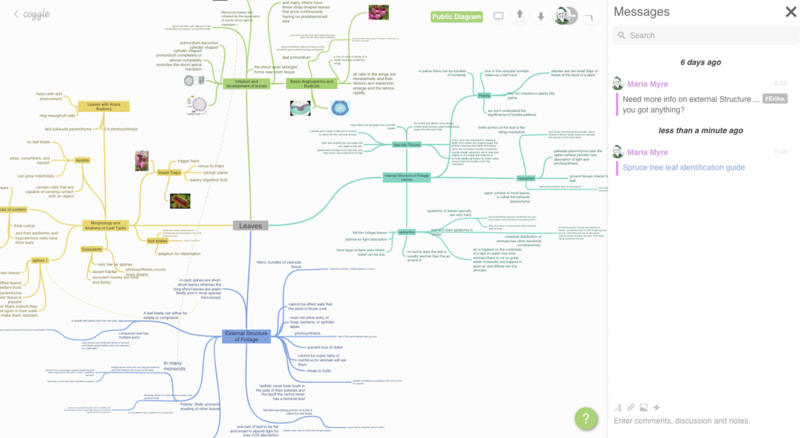 iMindMap Pricing: $100 for the Home & Student version that includes all basic mind map features; from $235 for the Ultimate version that also includes radial map view, organizational chart view, and 3D mode. The MindMup toolbar is easy to use, providing quick links for all the basic needs of mind mapping, from changing the color of each node to adding detailed text and file attachment. But it's the ability to publish and share your mind maps that sets MindMup apart. 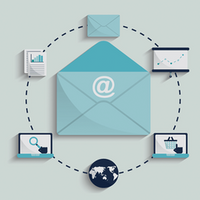 While many mind mapping tools require at least an email address before you're able to use their system, MindMup allows you to create and post public mind maps without logging in. Free mind maps are automatically deleted after six months, but if you're using it for a quick project, that does the trick. And you can always install the Google Drive add-on to extend the ability to share and collaborate with others. MindMup Pricing: Free for maps up to 100 KB; from $2.99/month for MindMup Gold that includes large maps and collaboration. 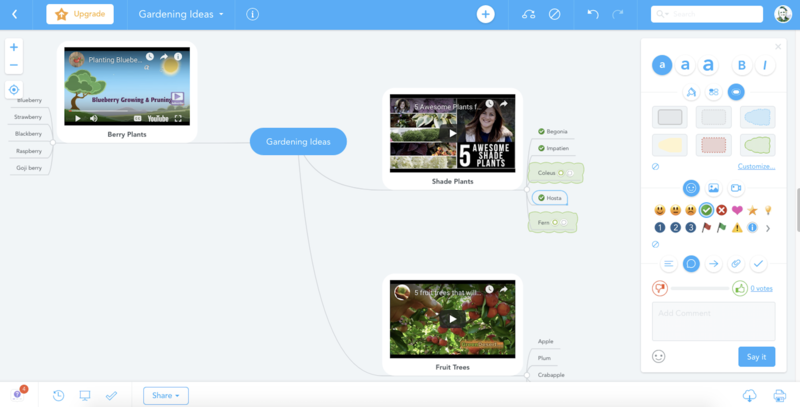 MindMeister is a robust tool that includes everything from quick keyboard shortcuts to the ability to embed live videos inside your nodes. 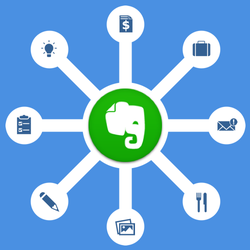 And its collaboration features are extensive: You can add team members to your mind map, upvote and downvote ideas, and leave comments. 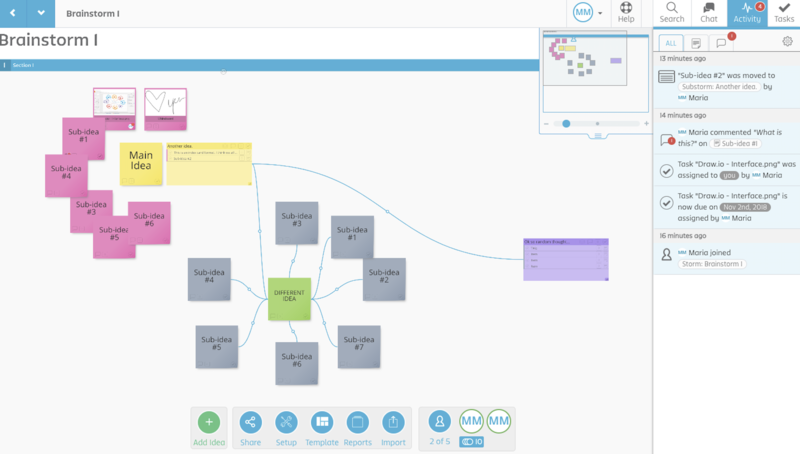 MindMeister is owned by the same people that make MeisterTask, a web-based, kanban-style project management app. 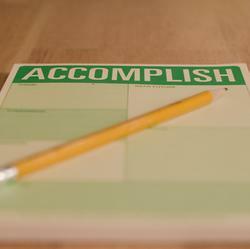 The two tools are integrated so you can turn your brainstorm session into an actionable project, assigning individual items on a mind map to members of your team, tracking task progress, and syncing it all with your other project boards inside MeisterTask. 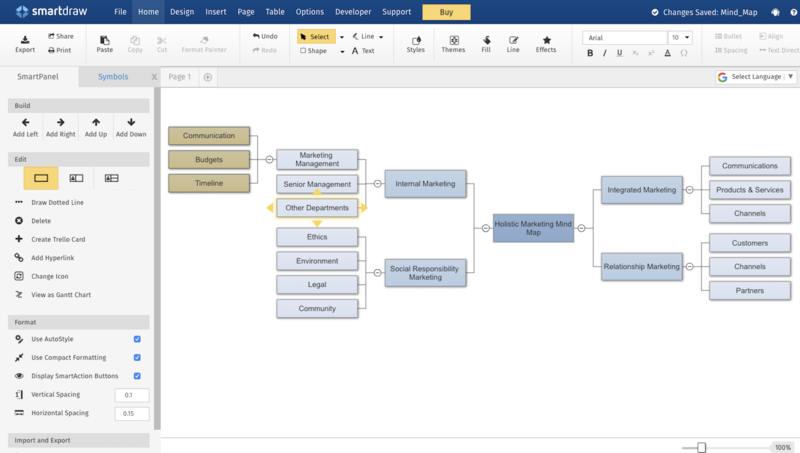 For an in-depth look at what a sample MindMeister/MeisterTask project might look like, take time to read through our article, "Jumpstart New Projects With Mind Maps." MindMeister Pricing: Free for the Basic plan that includes up to three mind maps and real-time collaboration. From $4.99/month for the Personal plan that includes unlimited mind maps, file attachments, and PDF exports. Most mind maps require you to begin with a central node, branching outwards from that single point as your mind comes up with new ideas and associations. 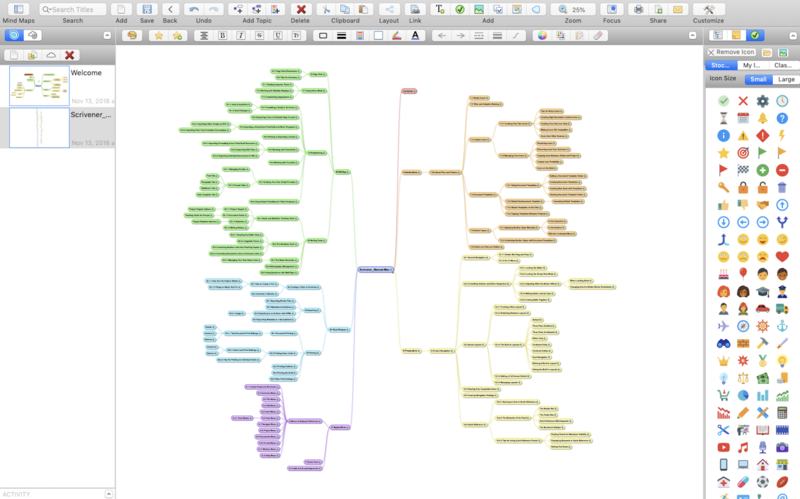 But if you're using Scapple, you have more flexibility in terms of where your visual mind map leads. For example, you're not limited to starting your mind map with a central theme. 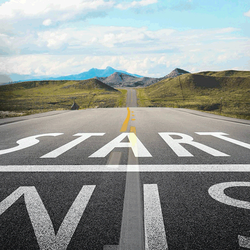 Instead, you might start with a tiny idea, then work "backward" to find the main idea. And Scapple lets it all happen organically, since individual nodes will only connect when you tell them to by dragging and dropping one on top of the other. In this way, complex relationships can be sketched out quickly, without losing the flow of rapid ideation. When compared with some of the other mind mapping apps on this list, Scapple's interface is relatively simple. But that simplicity also gives you the ultimate flexibility in terms of what goes where and how things should look. Unless you're in the same physical location, real-time collaboration isn't possible, but you can save your files to your cloud storage, so remote team members can access and edit the files. In a world of curves and circles, SmartDraw stands out as a linear mind mapping solution. Sub-ideas begin either on the left or right of the central node, and each subsequent sub-idea continues in that same direction. The benefit of this layout is that the entire mind map resizes automatically to fit your growing ides, and you never have to worry about one idea infringing on another's space. And, while the finished result might look more like an organized flowchart, it still follows the free ideation format of the mind map. The benefit of a linear layout like this isn't limited to personality types who prefer straight lines and organization. Rather, it allows your brain the freedom to create a mind map with the usual process, then shift gears to examine the logic of how each idea connects with each other. SmartDraw Pricing: $9.95/user/month; team accounts with multiple users are discounted at $5.95/user/month. Stormboard puts a twist on traditional mind mapping by using sticky notes, rather than nodes and branches, to record your ideas. You'll group your notes on different parts of the screen to represent connections during the initial mind map creation, then add the visual correlations with lines afterward. There's even a "rapid-fire" mode that will pop up a new sticky note the minute you post the one prior, so you can literally type out your ideas one after another with no extra effort—and save the organization for later. Stormboard also makes it easy to get your entire team involved in the process, since collaborators can record comments, create tasks, and add their votes to each idea. Plus, you can automate the process with Stormboard's Zapier Integrations, creating ideas and storms automatically whenever trigger events happen in the other apps you use most. Stormboard Pricing: Free for the Personal Plan that includes a maximum of five stormboards; from $5/month for the Startup Plan that offers access to additional features like advanced recording, live editing on Microsoft Office Online, template section labels, and additional export options. If you're gravitating toward creating your mind maps with sticky notes, you might also consider Padlet or MURAL. SimpleMind offers a full toolbar of options, so you aren't left guessing what features are included, and a variety of layout options (horizontal, vertical, or the traditional freeform mind map style), so you can control the look and feel of your brainstorming session. 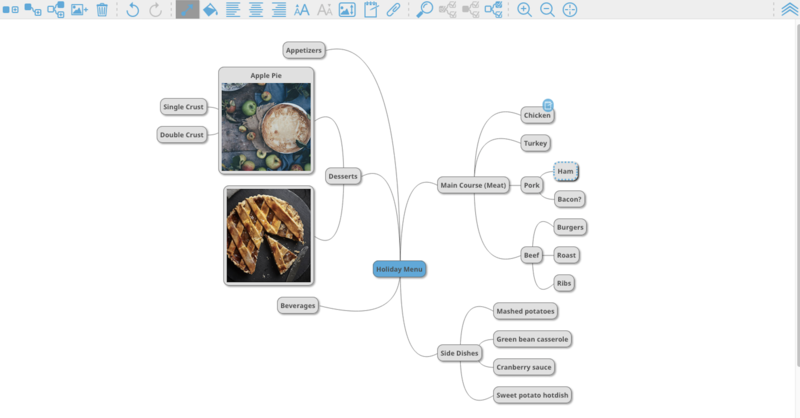 If you're using SimpleMind on your mobile device, you can add voice and video memos to your mind map, which makes it much easier to record a one-off addition to your mind map on the go. Just remember that if you want to access the same mind map across multiple devices, you'll need to save the map on the cloud, rather than locally. A unique feature of SimpleMind is that you can import a PDF file, and it will automatically "translate" that PDF into a mind map. This can save an hour or more of manual work every time you want to mind map the ideas within a book or article. Once the mind map is created, you then have the freedom to edit and alter it as needed. SimpleMind Pricing: Free version offers limited functionality. 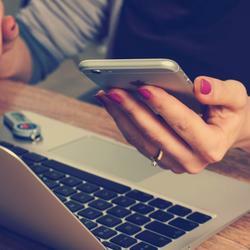 Paid apps include additional features like adding photos and file sharing. From $6.99 for mobile; desktop apps start at $24.99/user (with discounts as you buy more licenses). LucidChart is primarily known as a flowchart app. It includes all the elements you need to create a mind map, but also allows you to rework and refine your ideas into an organized, detailed flowchart. The mind map creation itself is simple: Drag and drop shapes onto the canvas to represent each idea and sub-idea in your mind map. 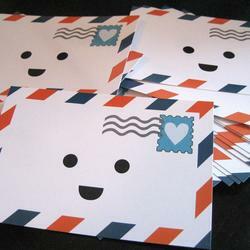 Then, create visual connections by clicking and dragging lines between related ideas. 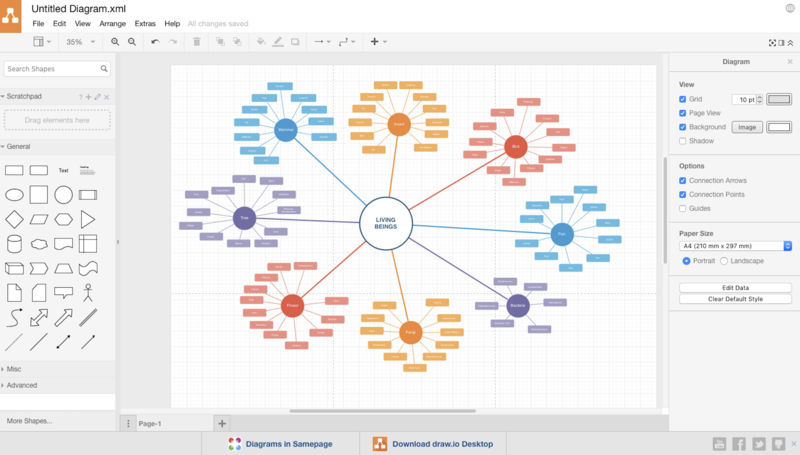 Once you've created your basic mind map, you can turn to LucidChart's other features to flesh out your ideas and fine-tune the connections between them. For example, you might decide to bring in some data and automate the next steps of your project, whether that means generating a UML sequence diagram, importing CSV files, or linking objects in your diagram to data that exists in Google Sheets. In short: When you need to turn your mind map into something more technically concrete, LucidChart gives you the tools you need to make it happen. LucidChart can read files from other similar mind map/flowchart apps, like Microsoft Visio, Gliffly, and Omnigraffle. LucidChart Pricing: Free for up to three mind map documents; from $4.95/month for the Basic plan that includes unlimited shapes and documents. Mind mapping is a personal experience. 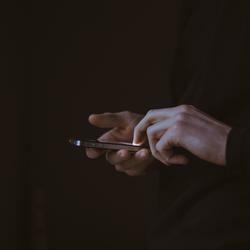 How your brain works will determine which app is best for you. Are you usually at your desk while brainstorming, or do your best ideas come when you're on the road? 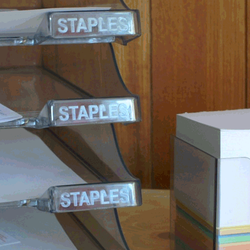 Do you think linearly, or do your ideas come out in a random order? 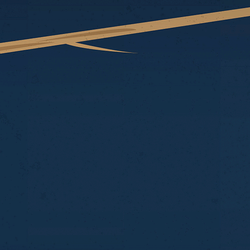 Do you tend to brainstorm with your team or on your own? Think through all these questions, and take advantage of the free trial on all of these apps before selecting your winner. Learn how to create your first mind map with this mind mapping tutorial. Get a detailed look at how you can use mind maps for project management.